The Pinnacle PCX Delta Series Post-column derivatization system for analysis of amino Acids, carbamates, mycotoxins, antibiotics and many other applications represents a new hallmark in HPLC analysis. Backed by over 30-years of experience, Pickering Laboratories have designed the Post column derivatization systems that have gained the complete confidence of agencies such as US-EPA, AOAC and many scientists across the world. The instrument automatically mixes the stream of effluent flowing from the HPLC column with a stream of reagent solution. The mixture flows through a reactor which operates from 50C above ambient to 130°C and supports a range of reactor dwell volumes from 0.1 ml to 3.5ml. The reaction coil withstands upto 42 bar inlet pressure at 130°C and also boasts of a thermal safety switch that limits temperature to 150°C. The Pinnacle PCX has a column oven utilizing circulating air and capable of programmable temperature gradients, a feature very useful in amino acid analysis. Using the temperature gradient program allows for improved separation, shortened analysis time and fine-tuned methods for specific compound detection. 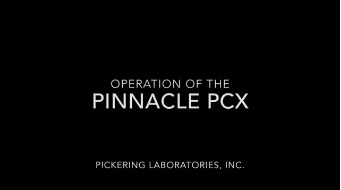 Compatible with any HPLC system and RoHS compliant, the Pinnacle PCX is available in standard configurations for one-reagent or two-reagents, standard or micro-volume. 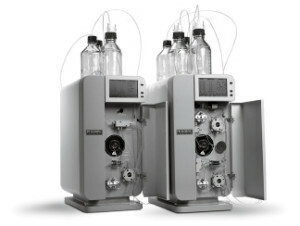 The two-reagent Pinnacle PCX contains two reagent pumps, two valves, heated and ambient reactors, column heater, backflow and over-pressure safety devices, filters, reagent reservoirs, gas manifold, Air Barrier gas tubing and other accessories. Compatible with all HPLC systems.